Diva’s first at-home do-it-yo-self gel mani in effect!! And it’s not even that it looks all that amazing in the end, I’m only a beginners, but it was just so easy and will only get better each time. It’s like learning to ride a bike. Start by just getting on. To give yourself an at-home gel mani that will last two weeks without a single chip (I couldn’t believe that mine really did!! ), you need to invest in an LED light. There are very expensive and probably superior models out there. I got a supercute portable mini 6W LED light from Amazon for only $25 (and free shipping with my Prime account, score!!). It has a preset 45 second timer and a little heart button to start the light. Adorbs! 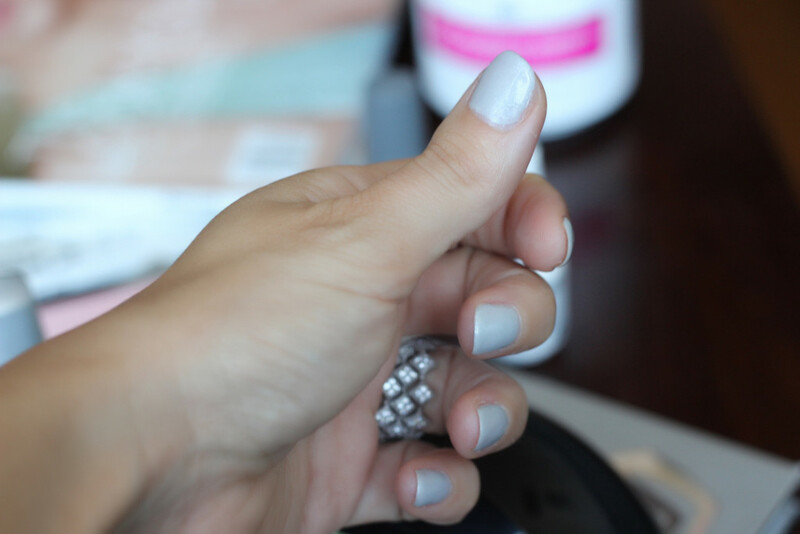 The steps for the Gelish DIY gel manicure are easy breezy, babes. Clean, file and push back cuticles on your nails. Buff lightly. Prep nails with nail polish remover. 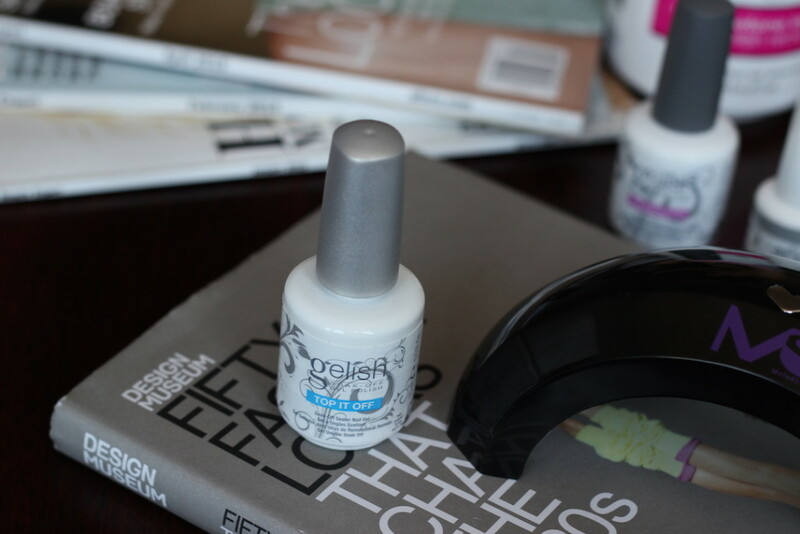 Apply Gelish Foundation Gel in a thin, smooth coat. Get as close to the edges as possible. Place nails under LED light. How long depends on your light. I went under for maybe 10-15 seconds for this step. (This too you learn as you go – as in, how much drying time per step is needed with your light and your products). 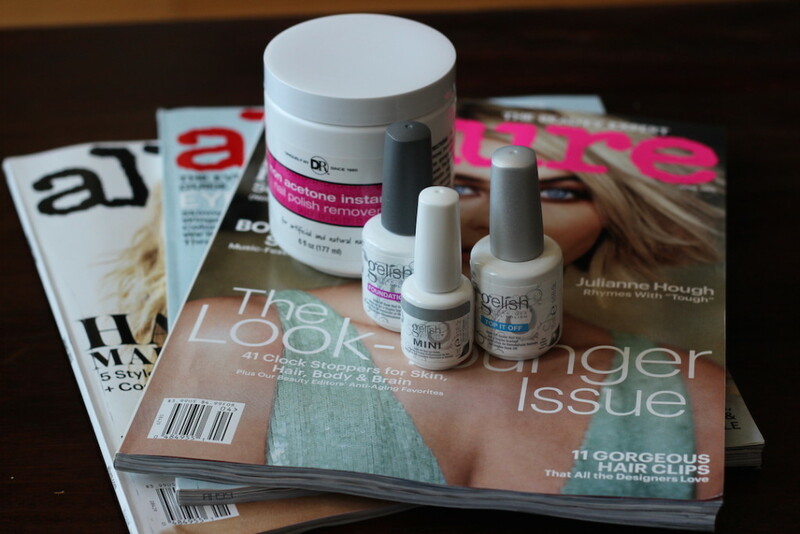 Apply Gelish Soak Off Gel Polish in your desired shade. I went with The Big Chill. Which is like a perfect grey/white with the subtlest of shimmer. NOTE: For this step, you want the thinnest possible application and gel polishes are thick to begin with so really try to layer it on sheer, while also getting close to the edges and reinforcing the tips. I found this to be a little challenging my first time due to the consistency of gel polish. And I ended up not going close enough to the edges at the base of my nail beds. Lesson learned. ALSO: you won’t automatically need two coats like most non-gel polishes. In fact, most likely one coat will provide enough color and coverage. Two may be wayyyy thick. So start with one thin coat and after you cure it in the light, see if you really need a second. Place nails under LED light. Again, time depends on your machine. And lighter colors need less time. I went under for 45 seconds. Til the device auto-turned-off. Apply Gelish Top It Off Gel Sealer in, you guessed it, a very thin coat over the full nail from cuticle to tip. Wipe your nails (that will now feel tacky to the touch) down with rubbing alcohol on a cotton beauty wipe. My beloved go-to wipe is by Shiseido. Add a drop of cuticle oil to the skin around your nails and rub in. Then admire your DIY craftiness. I’m no Mei Kawajiri (though I love her and die over her work) but my nails looked pretty presentable and the polish lasted for two solid weeks until enough regrowth was visible at the base that it was time for my next mani. That’s really all I could ask for. Will have to report back on that one. Here’s to hoping I nail it. Pun intended. I would like to try doing my own gel manicure since my manicures don’t last more than a few days!! Can you send me the links for the gel manicure. Who knows I might start a new career!!!! Thanks also for your meticulous directions. It seems quite easy and fast. PS. How do you remove the gel when the it grows out?